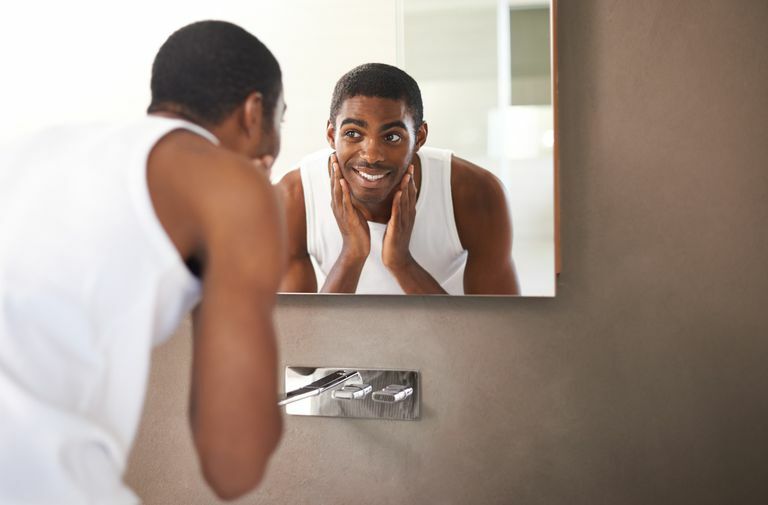 Because of its texture and growth pattern, African American men are likely to battle with small bumps on the face commonly known as ingrown hairs, or razor bumps, often from shaving. African American men are also prone to hyperpigmentation (dark spots) and dry skin. Before targeting problem areas, it is first important to discuss skin care basics to build a proper foundation. It is first important to determine the type of skin you have in order to practice proper daily skin care. Skin types can include normal, dry, oily, sensitive and even a combination of types. Based on your skin type, you will want to purchase products appropriate for your type. Wash – The most important step in your skincare regime is in proper washing. You should wash morning and before bedtime to remove environmental buildup and debris. Cream cleansers are great for sensitive and dry skin while foaming ones are needed for oily and normal skin types. Exfoliate – There are times when washing is not enough to remove dead skin or deeply embedded dirt, such as in blackheads. This is when an exfoliating becomes an important step. You shouldn’t exfoliate daily as the scrubbing action can be too harsh on your skin. Exfoliate once a week, or as needed. Tone – Skin toners are a liquid applied to the face with a cotton ball or pad. The toner will help to remove any last traces of dirt left on the face after washing, as well as minimize the pores. Be sure to use a gentler toner on sensitive skin while using a stronger astringent on areas such as the nose, where blackheads are prone to be. Moisturize – The final step in your skincare routine, it is incredibly important to keep your face moisturized. Hydration is vital to keep the skin youthful and firm and there are moisturizers to target all sorts of needs. Don’t forget to use a separate moisturizer specifically formulated for the eyes. You shouldn’t neglect the delegate skin around the eyes, as it is the first place that fine lines will typically appear. Hyperpigmentation – Darkening of the skin due to increased melanin can occur as a result of a variety of reasons. Scarring, acne, sunburns, as well as certain illnesses, can cause hyperpigmentation of the skin. As a result, darker pigmented skin is more susceptible to this condition. Often times, people think they need to resort the skin lightening products, but before doing so, it is important to speak with your dermatologist about being prescribed products containing Vitamin C, Retinol or Alpha Hydroxy Acids. If you have dark circles under the eyes, this is more likely due to superficial pigmentation. In this instance, you may need a lightening cream prescribed by your dermatologist. Most importantly to remember regarding hyperpigmentation is to take care of protecting your skin from the sun. Many have a misconception that African American skin cannot suffer from sun damage, but it is important to remember that all skin types need protection from harmful UVA and UVB rays. Be sure to use a moisturizer with an SPF of at least 15. Protecting your skin from the sun will decrease your chances of getting dark spots on your skin. Dry Skin – When African American men have dry skin, it can create a gray appearance to the skin, meaning, not only does the skin not feel good, but also does not look good either. It begins with your facial wash. Do not use a harsh or stripping cleanser. Use one that is gentle and hydrating, and wash in lukewarm water since hot water can also further dry the skin out. Hydrate regularly with a good moisturizer, as prevention is key. Use an oil-free moisturizer since you will be hydrating regularly as you will not want to clog your pores. Look for one that has natural ingredients such as Vitamin A and E and apply routinely. Stay on top of the hydration and you will avoid dry skin, the ashy appearance, and will keep the fine lines away retaining a youthful glow. Ingrown Hairs – Although not exclusive to African American men, you do battle greatly with ingrown hairs due to the way the hair grows from your skin. When the hair is cut bluntly from shaving, there is a sharp edge to the hair as it grows back. Add to that sharp edge a curl pattern to your hair growth, and you have incredible likeliness that the hair will curl back into the skin, causing the hair to grow inward. As a result of the inward growing hair, bacteria and fluid forms, causing a bump in the skin. Be sure not to mistake these bumps as a pimple and try to pick it, because doing so will only cause dark spots on the skin. Taking care to use proper shaving methods should help cut down ingrown hairs, but because of the hair growth pattern of African American men, you need to take additional steps to in order to deal with what seems like an on-going battle of the bumps. When bumps appear, use a warm washcloth and a gentle exfoliant to gently scrub in a circular motion over the inflamed area. This should help ease and open the pore for the ingrown hair to the come to the surface. You will also want to use a product containing glycolic or salicylic acid regularly.